Creative Block can be nasty. You're sitting in front of a blank page/blank canvas/blank beading board with a blank look on your face. Then begins a sinking feeling in the pit of your stomach accompanied by self-doubt, then the "I-feel-a-headache-coming-on" feeling followed by a mad dash for potato chips or ice cream or Twitter. began with one idea: “wood” And one technique: brainstorming. Creative Block can be nasty. You’re sitting in front of a blank page/blank canvas/blank beading board with a blank look on your face. Then begins a sinking feeling in the pit of your stomach accompanied by self-doubt, then the “I-feel-a-headache-coming-on” feeling followed by a mad dash for potato chips or ice cream or Twitter. Luckily, working through it is easier than it feels like it will be. Like with so many things, the hardest step is the first one, but once you get rolling, the creative rollercoaster will take over! That’s what I’m here for today, to help you overcome creative blocks and get the rollercoaster rolling again! One of my favorite strategies for overcoming creative blocks is one I learned in my college ceramics class. Make 100 Things. No matter what creative pursuit of your’s has become blocked, this will help you. 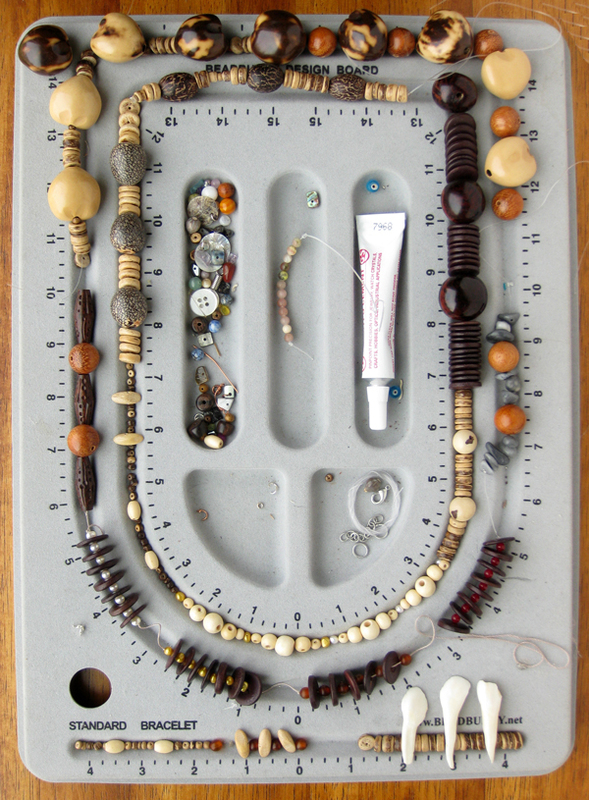 Write 100 poems, sculpt 100 sculptures, bead 100 necklaces, draw 100 cartoons. Seems impossible when you feel like you can’t even make one, right? Well, here’s where the playfulness comes in. This creative exercise isn’t about achieving something, it’s about letting go of something. You don’t have to make 100 award winning paintings, you just have to go go go as fast as you can and make 100 quick, seat-of-the-pants, anything-goes paintings! They can all be awful, it doesn’t matter!! Don’t try to imbue them with meaning, don’t try to do anything with them except to get them done. I was introduced to this technique when I was beginning a new semester in my undergraduate study and was left to strike out on my own and see what art I could come up with. *eeek! * My art professor gave me the task of making 100 ceramic sculptures after our first critique. She wanted me to make 100 sculptures by next week. By next week?! Well, I didn’t get 100 out. I think I managed to make 80 or 90. They averaged about twice the size of my fist. When we had our next critique and they were all laid out together, we could see patterns, a direction. Ocean creatures. Funny, I wasn’t expecting that! Well, from there I went on to create a whole semester’s worth of 4 foot tall ceramic ocean creatures. Colorful, fun to make, they filled me with wonder. The roller-coaster was rolling again! 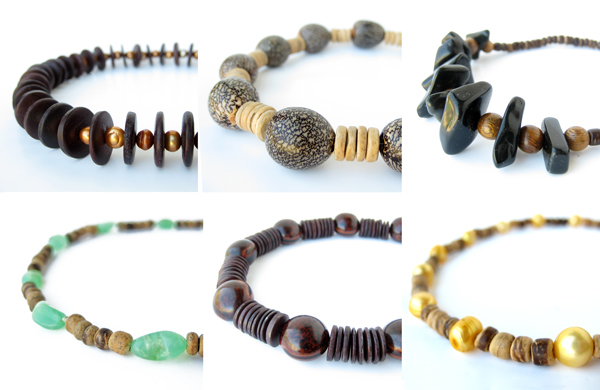 Just now, I’m working on creating a proliferation of wooden jewelry designs. Here, over the span of a weekend, is what I’ve come up with using my “Make 100 Things” technique. I’ve gotten up to 66 (if I count correctly!) and I’ll admit, they aren’t all winners. But I see at least 20 that I’m going to make right away! 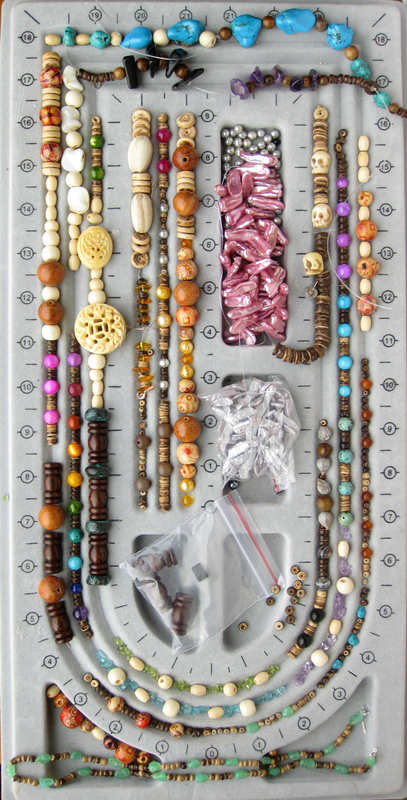 The simple act of sitting down and playing with all the wooden beads I have on hand has given me a familiarity with the new materials. I “know” them in a deeper way now and coming up with creative and beautiful ways to combine them will be a lot easier now! Amazing! thanks for the great tips! I’m going to have to try this too! Just keep going! Yay! Thanks Pei Li I’ve moved on to natural stone now! Thank you! This post is exactly what I needed. Ironically, my fb status today is about staying open and in the moment because you just never know where inspiration may come from! Feeling a bit of a creative block lately so I needed to reconnect with myself and be open to new things/sites/experiences in hopes of finding my next great idea….thank you for reminding me that I am not alone is this! You’re welcome! Another art professor of mine always said: “You’ll start making art again when not making art becomes more painful than making it.” Hang in there, it’ll start up again! Best tip I have heard in such a long time!!! I am going to take your advice and try this with my mom and sister. Ready to see what we come up with!!! Excellent advice! Excuse me, gotta go make 100 things now! I sat yesterday, in a studio overflowing with supplies, and peeled paint with my fingernails off my studio table. To say I need a kick in the pants would be an understatement. I need to go home and start making 100 of “something” thanks! I hear ya! You finally get a big block of free time for creating and you just aren’t feeling it. I know that for exercise they decided that “feel the burn” was the wrong attitude, but for making art, sometimes it’s necessary! Great advice! I have found just opening my Etsy shop, has been a great catalyst to creative energy. It kind of follows what your saying about just doing it. It’s been great to realize the more I create the less blocks I have. Course that doesn’t mean I never have them, going thru a bit of one right now on a necklace I started. Very nice, I posted this to my Facebook wall. I’m not currently experiencing a block, but I still think this is a fun experiment that will help me flow more. Thanks! Wow! Interesting article. Thanks for sharing. The idea of creating 100 of something sounds daunting, but I will give it a go. and my creative block, which I’ve experienced before, but never this bad, has lasted over a year. I have half heartedly continued to pursue my craft, however, I have been on etsy for over 2 yrs and have only sold 3 pieces. I don’t believe I am still having a creative block as much as “creative depression”. Funny….I was just looking at my pictures that I put up on my shop, they all kind a looked the same. Of course,the colors and descriptions were the same. I was just wondering whats going on with my mind and then I read this post. This is just what I needed, Jenny! I keep spreading out materials and staring at them. I think I know the root cause and your techique might help me get over it. I think I’m afraid that everything I design won’t be perfect, so I get stuck trying, discarding, trying, discarding. I can’t wait to get started on my 100 new designs. Thank you! FYI to Elizabeth, I had the same problem with little selling off my ETSY site. What recently gave me a kickstart is the exact advice I keep reading…post, post more, then post even more! I went on a spree recently and posted dozens of items and 3 new orders just rolled in! I have a long way to go, but it is energizing. Thank you so very much! I make beaded jewlery and I have this problem all the time! It’s late tonight but I’m gonna try this tomorrow. I’ve had the block for awhile and I will let you know if this works for me……..stay tuned! Wow, this is so me right now. I have no choice but to try this 100 things technique. Great idea! Just the kickstart I need. Thanks for reminding me of this! I too was given a similar directive in art school! I had forgotten all about it. I have been stuck lately and you have just made me wake up and get going! Thank you so much for this!!! I guess Ive always wanted someone else’s opinion or thoughts about what to make…. this makes so much more sense and I will start to do that right now. I happen to make and design my own jewelry as well as anyone else who would like any jewelry made…. for now it is just a hobby but hoping to make it into a career as soon as I can. I started at the age of five so creative block has been a huge thing for me over the years, So I really appreciate this advice Thank you so much. Pingback: Katie's Basement | Having Creative Block? Try this!